SO - HOW DOES IT WORK? Traditional heating systems are very inefficient. Mostly they rely on heating a small area to a very high temperature in the hope that that heat will be enough to warm the whole room. 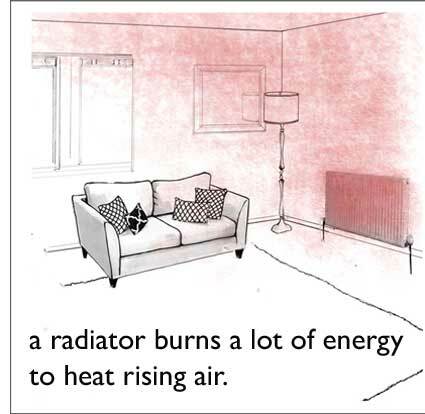 Radiators, fireplaces, air vents etc all suffer the same basic inefficiency, using lots of energy to heat a small space, with most of the warmth being wasted on rising air which never even reaches those parts of the room which need to be warm. 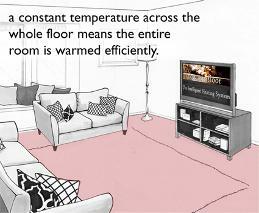 In the past, other underfloor heating systems have tried to improve on this by heating the whole floor surface. The problem has always been that they have used coiled 240v wires, or piped hot water, and the installation & running costs have made them too expensive for most people to consider. 1. As it is only a little more than 1mm thick it can be fitted under any floor covering or surface without significant building work or changing the room. 2. The unique 24v low-consumption element conducts heat through it’s entire surface - not just along wires or pipes. This means that we can achieve the same room temperatures using less energy by heating a larger surface to a lower temperature. 3.The ‘intelligent-plastic’ carbon-polymer elements ensure that the whole floor surface is kept at a constant steady temperature. An area warmed by a patch of sunlight will automatically draw less energy, whilst an area by a cold open door will automatically draw more. Until recently underfloor heating was not seen as a particularly economical or efficient option, but now the EPWarmfloor Heating System delivers the lowest energy consumption per square metre. Unlike most underfloor heating, EPWarmfloor offers a complete heating system rather than just a simple electrical element.